Beautiful European hand carved double balustrade system with middle ring design and would look great on your balcony, pool or front entrance. Please contact us with your custom dimensions. Colors: White, Off White, Cream, Tan/Yellow, Beige, Zebra Black And Rosetta. SKU: mb109. 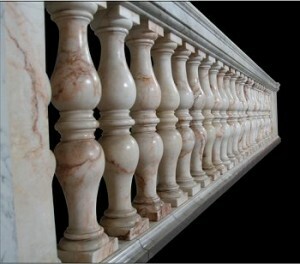 Category: Hand Carved Imported Solid Marble Balustrades. Tags: hand carved marble balustrades, imported marble balustrades, marble balustrades, solid marble balustrades. White, Off White, Cream, Tan/Yellow, Beige, Zebra Black and Rosetta.